Frozzzzzen Perfection - Cooking With C.C. I love Italian food – and I love it even more when I get to eat it while I’m in Italy! With great pastas, meats and desserts, there is one treat that I have to have at least every afternoon I’m there – Gelato! I think my favorite Gelato place is Il Gelato Vivoli in Florence. At least once every afternoon any time I am in Florence, I make the trek towards the Uffizi Gallery, cutting through the Piazza della Signoria, past the Palazzo Vecchio, down a few blocks, take a left and I find myself at Vivoli. If I’m too far away when the Gelato urge hits, there are many wonderful places to stop and get a treat until I can get back to Vivoli. Just stay away from the tourist style carts where they will be happy to sell you bad Gelato at a very high price! 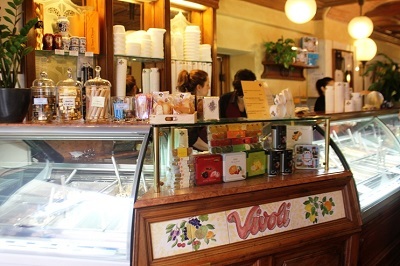 If you are in Florence, there is a great battle over which is the better Gelateria – is it Il Gelato Vivoli? Or is it Gelateria Carabè ? I’ve had both, and I would take either one! Gelateria Carabè is next to the Academy (and serves the Sicilian style) – so after feasting your eyes on the sculptures of Michelangelo, a feast of Gelato is in order! So what makes Gelato different from Ice Cream? Two main differences – first, Gelato has less butter fat than Ice Cream and there is less air whipped into it (called overrun). The gelato style outside of Sicily includes eggs – the Sicilian style doesn’t use eggs, but uses other stabilizers in the gelato. Since I’m not headed to Italy any time soon …… the next best thing is to make Gelato at home. Since I am a chocoholic, a deep, rich, dark chocolate Gelato is what we needed. 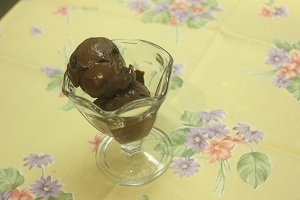 I planned the chocolate Gelato as part of the dessert in the Italian Summer Celebration class in August. All I can say – man was it good!!!! Here’s the recipe – it’s pretty straight forward. A couple of notes on the ingredients. This recipe uses only whole milk. I’ve seen other gelato recipes that include some heavy cream. 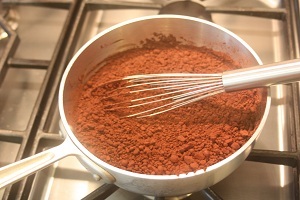 For the chocolate, to get the intense flavor, I like to use both cocoa powder and some chocolate. For mine, I used El Rey 63% bittersweet chocolate (in Huntsville, you can sometimes find it at Earthfare in the cheese section, otherwise, a good semisweet chocolate in the 60% range works great – DO NOT USE Chocolate Chips) and Valhrona cocoa powder. Divide the milk – whisk the cocoa powder into 1 cup of the milk. Put in a saucepan and bring to a boil. Remove from the heat and add the chopped chocolate and stir until the chocolate melts completely. In a second saucepan, add the sugar and 1 cup of the milk. Heat until the sugar fully dissolves. Remove from the heat. In a bowl, whisk the egg yolks until lightened. Gradually add the hot milk mixture into the egg yolks whisking constantly. Pour the egg and milk mixture back into the saucepan. Cook egg yolk mixture over medium heat, stirring constantly until the custard thickens and coats the back of a spoon. Pour the egg mixture into the chocolate mixture and stir well until the custard smooths out. Cool the custard. Once cool, add the mixture to an ice cream maker per the manufacturers directions. The gelato may not freeze completely, put into a container and put in the freezer to allow to completely freeze.